A drone video that showed poachers being caught misses the point. By Kimon de Greef for GROUNDUP. A drone video published on Facebook on 21 February reveals, in remarkable detail, the co-ordinated effort behind an abalone poaching operation in Pearly Beach, a holiday town on the Overberg coast. The clip has gone viral but fails to properly consider the root causes of South Africa’s abalone poaching problem: that access to wealth and marine resources remains deeply skewed along racial and class lines, leaving a gap that the poaching economy has expanded to fill. The video shows nine divers kicking through kelp beds, repeatedly submerging to lever abalone from the reefs; they then return to shore to de-shell their catch. A pickup van collects them when they’re finished, followed by a crew of runners sent to collect their bags. Alerted by the drone pilots, the authorities pull up in time to confiscate the poached abalone (this will later be auctioned off by the fisheries department) while the runners scatter. Scenes like these play out almost daily in places where there is abalone in South Africa. According to Traffic, a non-profit organisation that monitors wildlife smuggling, poachers have harvested more than 40,000 tons of abalone here in the last two decades — nearly 20 times the entire legal catch. Chinese mafia groups control the trade in alliance with local street gangs, shipping the product to Hong Kong, where abalone has been a status symbol for more than 2,000 years. Dried South African abalone, the priciest mode of consumption, is worth over R45,000 per kg of flesh when converted back to wet weight. Profits from these sales trickle down to local syndicates, sustaining a poaching epidemic that has depleted stocks while placing the commercial abalone fishery in jeopardy. This is the situation that the video — shot by two founders of a Cape Town drone start-up, acting in their private capacity — sets out to address. “Relentless Poaching is Ravaging the South African Coastline,” reads a caption early in the clip while a piano soundtrack plays. The lesson of the video, the viewer learns, is that “two guys and a drone were able to intercept a group of almost 20 individuals in just this one operation”. At first blush this seems an effective strategy, the reach and resolution of a flying camera enabling two concerned citizens to disrupt a poaching hit that would otherwise very probably have succeeded. And it certainly could be, if linked to a wider management plan. Yet the drone clip records only inadvertent fragments of the bigger story that has allowed the abalone black market to evolve. After fetching the divers, the getaway van speeds down a coastal road, passing holiday homes with garages and sea views. 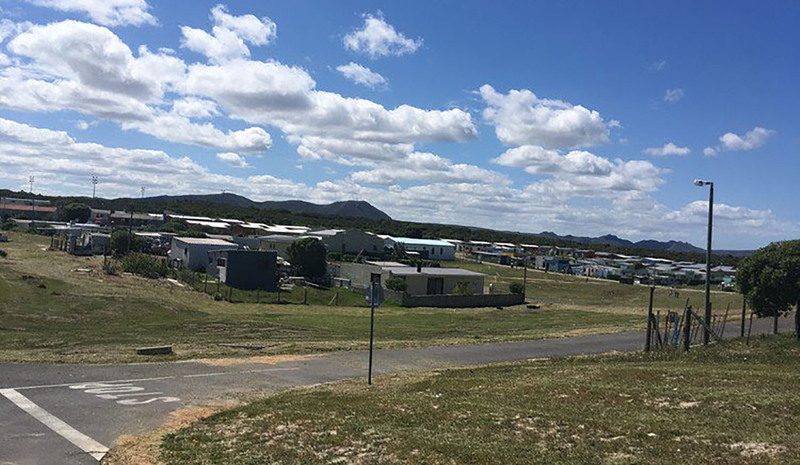 The drone tracks the crew back to Eluxolweni, a small informal settlement outside Pearly Beach where dozens of poachers live in RDP houses and metal shacks. The disparity of this visual data is not remarked upon, though the producer, who happens to be a schoolfriend of mine, added a few lines about poverty and fishing rights to his original Facebook post when I challenged him on its lack of context. Still, the message is not clear enough, and I want to state it unequivocally: abalone poaching is a logical response to the inequality that still defines South Africa two decades after apartheid’s demise. Since 2012, when I began researching a master’s thesis on the abalone trade, I have interviewed dozens of poachers from fishing communities across the Western Cape; at present I am working on a book with a diver whose family was evicted to the Cape Flats under the Group Areas Act. Settlements like Paternoster, Hangberg, Hawston and Gansbaai, where poaching is most firmly embedded, share long histories of dispossession, often stretching back generations before apartheid. Today they closely resemble each other: coastal ghettos split off from the mainstream economy though they are adjacent to wealthy white neighbourhoods, with protracted wrangles over fisheries reform still preventing most fishers from profitably accessing the sea. In these areas, abalone poaching, while dangerous and criminalised, offers a rare opportunity to earn better money than South Africa’s society ordinarily dictates, even though that means entering an underworld economy intertwined with gangsterism and drugs. Without this critical ingredient, it is extremely unlikely that abalone poaching would have exploded into the crisis it has become today. Long before coloured fishing communities plugged into the abalone trade, in fact, poaching was largely the domain of renegade white men. The poaching stereotype in Cape Town in the 1980s was a sunburned student who dived perlemoen now and then for pocket money or to subsidise his university fees. (Port Elizabeth today has a large network of working-class white abalone poachers.) In other countries with wild abalone stocks, like Australia and the United States, poaching has been restricted to small bands of opportunists without widening into a systemic problem. Until we begin to grapple with the inheritance that has driven poaching into overdrive in South Africa we will fail to learn from our mistakes. Just last September, in fact, a man in his 30s from the Eluxolweni township was killed by a great white shark, swimming 3km out to Dyer Island, a global cage-diving hotspot, to harvest abalone with a group of fellow divers. He was a Xhosa migrant from the Eastern Cape, among a new wave of marginalised South Africans to join the abalone trade. When I reported the story for GroundUp I saw many similar reactions on social media, claiming that the diver had got what he deserved. Of course, it isn’t fair to hold content producers entirely responsible for how other people respond to their work, but in this instance the drone pilots — two young white men with the means to launch their own business — missed an opportunity to present a more balanced take. At the least their video could have dissuaded viewers from reaching for the sort of easy and myopic responses to illicit coping strategies that we so often see from South Africa’s privileged minority, who by and large still benefit from centuries of white supremacist rule. For the many more viewers who care about the environment and do not hold hateful beliefs, the video could have provoked a conversation about what sustainability, in its widest sense, might actually look like in South Africa, taking its legacies of dispossession into account.